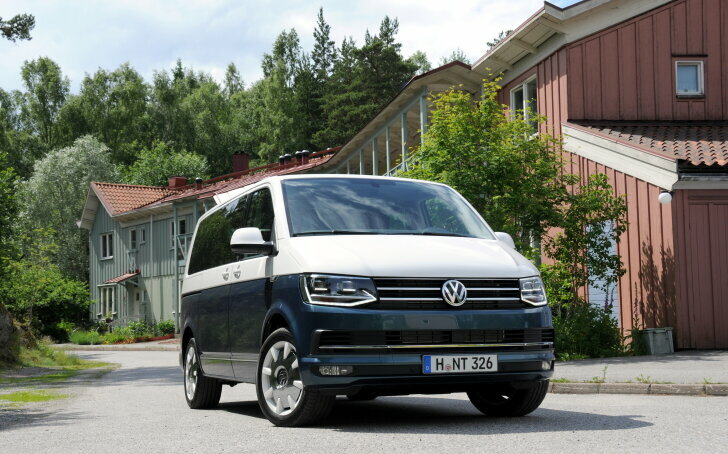 Review | First, the world press gathered in The Netherlands where the Volkswagen T6 (sixth generation Transporter) was unveiled. Now the press comes to Stockholm to actually drive Volkswagen's new van. What makes the Transporter so special? Isn't it just a tool for construction workers and plumbers? 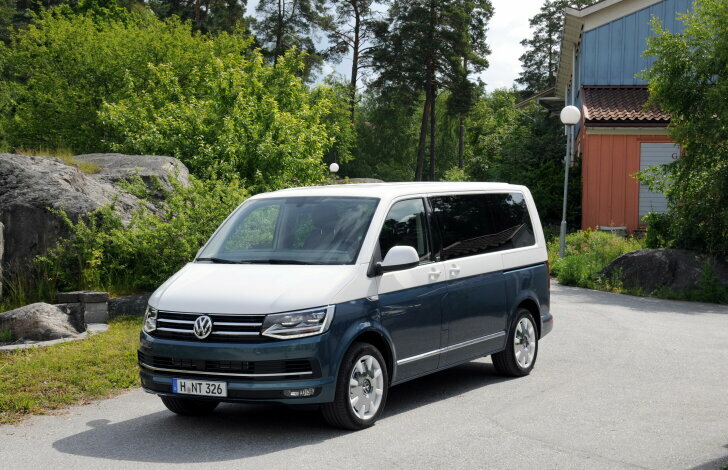 Or does the T6 have something special to offer? What the Transporter has to offer is diversity. Volkswagen is by far the market leader in this segment and that's thanks to the wide variety of commercial vehicles it offers. 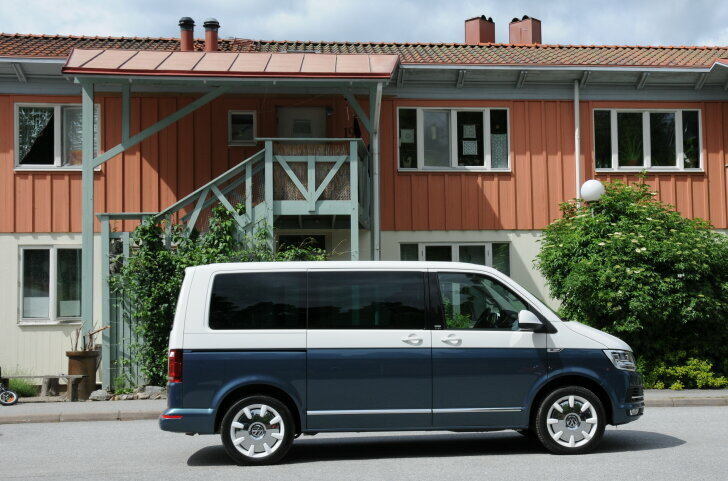 For example, the Transporter is available with a long and short wheelbase, with a normal or raised roof, with a single or double cabin, with sliding doors or pivoting doors, as a van or pickup, with a diesel or petrol engine, with front-wheel or all-wheel drive, and... as a luxurious "Multivan", turning it into a spacious people mover. To make things even more festive, the latter is available in a gorgeous "Generation Six trim. The paintwork has been executed in two colours, based on a colour scheme of the classic "bulli" (a pun based on the first letters of the German words for bus and van ("lieferwagen")) which started it all in 1950. As a hint to the genesis model the test car has white rims, which mimic the white tyres used then. 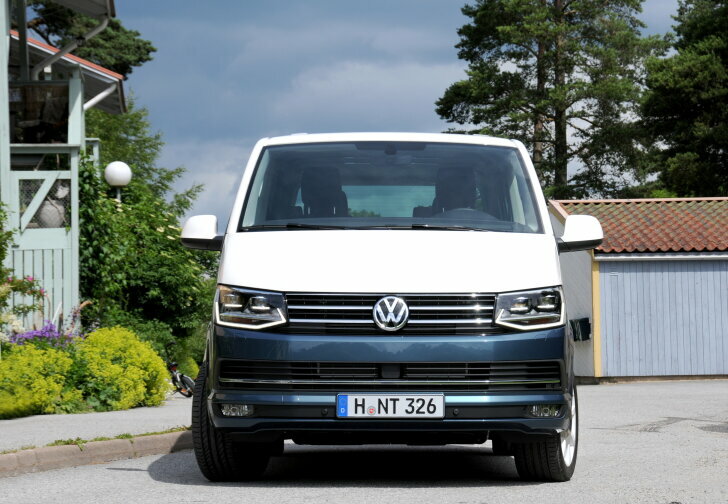 A basic Transporter has a sober, tough cabin which is built to stand years of intensive use. The dash is littered with storage spaces to hold tools, paperwork and of course cups of coffee to keep the workers going all day. Only the small glove box is a disappointment. The cabin of the Multivan is completely different. It has the same refinement of the domestic Volkswagen cars. And the "Generation Six" is even better looking thanks to accents in the colour of the car, beautiful (illuminated!) door sills and two huge sofas (instead of the two and a half seats in the commercial vehicle). The new Transporter offers many of the luxury and safety features of Volkswagen's domestic cars. Examples are active cruise control (automatically keeps a safe distance from the vehicle in front), active city stop (automatically brakes for danger at low speeds) and high beam assist (automatic high beam without blinding oncoming traffic). Even the "infotainment" system is high-tech supporting both Apple CarPlay and Android Auto. In the rear, the Multivan is also luxurious. The sofas (the word "seat" does not do them justice) are mounted on rails and can be distributed over the huge passenger area to suit any occasion. Of course the Multivan offers several storage spaces, tables and a separate climate control for the rear. This means the Multivan isn't just more spacious, but also more luxurious than even the biggest MPV. 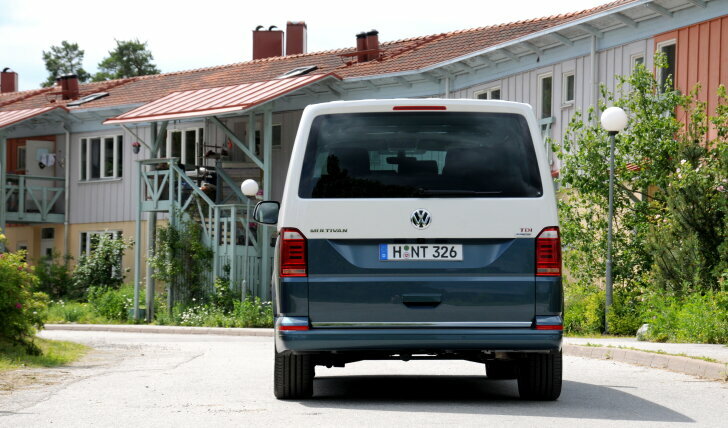 The commercial version of the Transporter has exactly the same load compartment as the previous generation. This isn't because Volkswagen couldn't do better, but because customers wanted to keep using bespoke parts like toolkits. No matter about its good looks, from the very start of the test drive it's obvious this is a van and not a regular car. Not only does the seating position behind the steering wheel differ, while cornering, body roll is much stronger than in a normal car. That's because the Transporter has to handle well with various loads. Most domestic cars hardly ever carry their maximum allowed weight, so the engineers focused on daily use with just one or two occupants when fine tuning the suspension. Also, the weight of the luggage in a basic car is relatively small compared to the weight of the car. The Transporter can almost carry its own weight in load! During the test drive a 500 kg load was carried, and with that the Transporter is perfectly balanced! Without any luggage the pressure on the rear wheels is too low, which is best noticeable during an emergency stop. Yet, the Transporter was more forgiving than before. Handling improved greatly and the difference between no load and full load was diminished. As stated before, the Transporter owes it success to the many versions available. Therefore, this test starts modestly: with the 85 kW strong "BlueMotion". This isn't merely the entry level model, it is also the most frugal version. Performance of this base engine is more than adequate, even when carrying a load. Even when the engine speed is low, the 2.0-litre diesel shows enormous flexibility. To improve fuel efficiency an idle start system and a gear shift indicator come as standard. The latter doesn't only indicate when it's time to shift up, but also when it's better to shift down. That's important, because when carrying a heavy load the engine can be damaged when the engine speed is too low for long periods of time. The test drive with the Transporter BlueMotion (including 500 kg of freight) cost 5.1 litres per 100 km (55.4 mpg) (factory figure: 5.7 litres per 100 km(49.6 mpg)). That isn't just an excellent figure for a van, it is a great figure for any car! The next level is the 110 kW strong diesel engine. From the moment the clutch is released, one notices this power train performs with more ease. And while the Transporter BlueMotion already comes along with traffic effortlessly, the 110 kW easily outperforms many other cars! The top model is fitted with a 150 kW strong diesel engine, which can be combined with a DSG transmission. DSG means an automatic gearbox with a dual clutch, which shifts quickly and unnoticeably. With this strongest diesel engine under the bonnet the Transporter can burn some rubber. The overwhelming power makes the Multivan eager, while the 400 Nm of torque makes it mighty at the same time. On top of that the Multivan has much better sound insulation than the Transporter, making it almost as comfortable as a domestic car. Volkswagen proudly presents the sixth generation of the Transporter. The T6 doesn't just look more modern, it is high-tech underneath as well. Many of the luxury and safety features of Volkswagen's domestic cars are now available in this commercial vehicle. Thanks to modern engines, both performance and fuel economy have been greatly improved. Of course, practical use still comes first. The loading area hasn't changed at all, so all bespoke toolkits fit without modification. Comfort and handling have been improved as well. Still the Transporter (Multivan) doesn't handle like a private car, but - despite the load - handling is better than ever before. And that is a big deal indeed.